Long-term complications include vomiting and gallstones . You may be given laxatives or an enema. General anesthesia will be given through an IV. It will block pain and keep you asleep through the surgery. An 8-10 inch incision will be made to open the abdomen. Surgical staples will divide the stomach vertically. The new stomach will be the shape of a slim banana. The rest of the stomach will be removed. Your new stomach can hold 50-150 mL (milliliters) of food—about 10% of what a normal adult stomach can hold. Staples or stitches will be used to close the incision. The usual length of stay is 4-6 days. If there are any problems, you will need to stay longer. 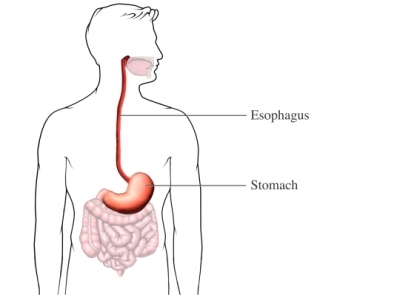 A small thin tube with a camera will be used to look down your throat and into your stomach to check for problems. You will receive nutrition through an IV at first, but slowly start eating again. Eat a clear liquid diet for about 1 week or as advised by your doctor. You will begin with 4-6 small meals per day. A meal is 2 ounces of food. Progress from soft, pureed foods to regular foods.